To describe my ‘home’ (I thought) for all but one night of the next 10 days. The ‘soft seat’ coach was the very last of about 18 carriages which comprised the Pyongyang –Rajin train. As I’ve written in the post on train travel in China the name ‘soft seat’ is a bit of misnomer. It might have had relevance when the ‘hard seat’ was actually a wooden board (and not a six-berth compartment as it is now) but I can assure anyone that after spending a considerable amount of time travelling on trains in China, the DPRK and Russia the last adjective to describe those seats is ‘soft’. The carriage had 9 compartments (4 berths in each) with a corridor running down one side – the sort of carriages that were the norm on British railways until they were phased out from the 1970s. This one was Russian made – quite a long time ago – and all the original signage was in Cyrillic. Everything was clean and the berths in all the compartments were laid with sheets and blankets ready for the passengers most (if not all) of whom, in this coach, would be travelling well into the night. Unlike the Chinese trains there was no hot water flask in the compartment. There was a toilet at either end, the WC kind – some of these carriages often have a squat toilet as one of the options but not this particular one. There was a smaller two berth compartment (which was for the staff) next to which was a small galley – not very well equipped but adequate for the task it was to perform. Next to the galley, accessible to the public, was a large hot water boiler – an indispensable piece of kit for any train operating in the east Asian and Russian area – instant, dried noodles being a staple for many travellers. The carriage had seen better days but as I got to ‘know’ it over the next few hours I thought that I would be able to accept what it had to offer for the time of my journey. Until I arrived in Rason (and more particularly after I had arrived in Tumangang) I thought it would be this very carriage that would see me all the way through to Moscow – I was wrong (but, again, that will come later). It could have done with a bit of tender loving care and a small investment would make it as acceptable as anything new and more up to date. It didn’t have a power point in the compartment – which I would have liked for my computer – but there were a couple of points in the corridor and with a little bit of planning and forethought the power issue could be overcome. I knew there were no catering facilities available but a short time after the train left Pyongyang, when I went exploring, I realised that the connection between this final carriage and the rest of the train was locked and that a trolley that would serve the rest of the train couldn’t come anywhere close to me. That was something I wasn’t expecting, having thought that the trolley would be able to supplement whatever I had brought with me. Here was another of those ‘unknowns’ that didn’t work out as I had hoped. This had not been the case on the Dandong-Pyongyang train as the two young women who operated the trolley on that journey seemed quite fascinated that two Caucasians were on board – and who were wound up by some of the men in the carriage about our reasons for travelling. Another point worthwhile making here, before going any further, is that even though the people in the north of the Korean peninsula are demonised by so many of the governments (and its sycophantic media) in the capitalist world (including the erstwhile Socialist countries of China and Russia) I never encountered any animosity in the limited amount of contact I had with the people during my time in the DPRK. In fact, it was quite the opposite when they realised that I was there to try to learn and understand a bit more about their country and not to continually find fault with all that I saw. I’m not saying that the country doesn’t have its issues but critics would do well to look at the problems in their own countries before loading their opprobrium on to the DPRK. When I had arrived at the station there was a lot of activity in and around the carriage as those travelling stowed their luggage (many people who travel on these long train journeys often travel with huge amounts of luggage and there’s a rush to find space before others get there first) but once we moved away from the station the whole carriage got very quiet, everyone, including the staff but apart from me, retreating to their compartments, doors closed, probably resting after an early start. Even the samovar took some time to warm up and it was three hours or so before hot water was available. It’s always possible to see much more from a train than in a mini-bus so it was useful to get my bearings as we passed through the outskirts of Pyongyang, picking out the landmarks helped as there are some very tall and distinctive buildings in the city, and was able to put together a mental image of the locations I had been to, and had passed, in the previous days. Pyongyang main railway station is in the west of the city (the newer part expanding towards the east and the south) so the route out is initially to the north-west and then curving around to the north and the city is left behind after less than 10 kilometres into the just a smidgen under 800 kilometre journey. Being predominantly an agricultural society it wasn’t long after leaving the capital behind that the route took us between rice paddies, as far as the eye could see. This had been the same on the journey from Dandong, all the fields on both sides of the train filled with the golden colour of just about to be harvested rice. And this went on for miles, only being broken up by occasional orchards, fields growing cabbage (for the ubiquitous kimchi) and other smaller concentrations of other vegetables. Not being an expert on rice everything looked well to me. The crop looked ripe, it wasn’t blown down or damaged (except in a very small number of paddies – indicating that the weather hadn’t been unfavourable at the wrong time) and some of the early rice was already being harvested – an increasing number of paddies had cut sheaves of rice standing on end in order to dry out before being taken away for threshing. Although the area covered by rice was huge the paddies were of varying sizes, as is the case with paddies in order to make the flooding manageable, but there was no indication of any individual ownership. When people were working in the fields they were almost always in groups much larger than you would get with private ownership so these must have been collective or State farms. This should mean that the autumn 2017 rice crop was a good one for the DPRK. There have been a few bad years in the recent past, an issue which is affecting many countries due to the consequences of climate change, so a good year offers the country the opportunity to fill up grain stores for possible collapses in the crop in the future. The country’s dependence upon one crop is something I would have thought should have been studied. If so much importance is placed on one crop then there are any number of possible problems that could arise from climate being wrong at the wrong time to the threat to a whole crop that could arise from pests and disease. Although I was only travelling along a very narrow corridor rice dominated the horizon and the only change in the dominant crop occurred when passing through areas where rice was impossible to grow – where maize became ubiquitous. One thing that was very obvious, from both the train journeys and passing so many rice paddies, was the lack of any significant mechanisation in the process, of either the harvesting or the transporting of the rice crop. Although land ownership looked collective I only saw one small tractor being used during all the time I was looking out the window. There are economic reasons why mechanisation is not appropriate for farmers with small areas of cultivation but when it comes to a whole village working the land surrounding it there should be more than an economic reason to employ machinery. Rice planting and cutting is a particularly back-breaking form of agricultural labour – constant bending being necessary – so anything that can reduce that will have an immediate benefit to the workers in the countryside. The collectivisation of agriculture in the Soviet Union in the 1930s – and 20 years later in China – was only possible with the revolutionary transformation of industry in the cities and the bringing of the industrial revolution to the countryside. Tractor stations which provided, and maintained, all the machinery needed for an efficient and productive countryside were an integral part of collectivisation. Without one you wouldn’t have had the other. Not only is it economically more efficient it also transforms the peasant in the countryside into a worker in the countryside, raising him/her to the same status as the worker in the city. Breaking down the divide between the town and country being an important aim of the revolution in what were predominantly peasant countries. Reducing the time spent in the fields doing hard manual work allows the agricultural workers to diversify and also to improve their skills through education for themselves and their children. There’s nothing wrong with children working, at times, in the countryside, especially at times of harvest, as it educates them into the world of labour. But to depend upon that labour has the potential of keeping the countryside in the past and prevents developments for the future. Economic sanctions under which the DPRK has had to live for a number of years now (assisted by the pusillanimous and sycophantic attitude of both Russia and China – whose own self-interests are more with the DPRK than the US imperialists and their hangers-on) don’t help. Fuel oils being in short supply mean that priorities have to be decided and perhaps fuel for farm machinery is one area that suffers. However, after so many years after Liberation I would have liked to have seen more evidence of machinery in the countryside. I don’t think that people who haven’t spent a significant amount of time living in an Asian country can quite understand the importance of the rice crop and how much of a staple it is. Rice is served at EVERY meal and people eat rice in quantities which have never ceased to amaze me. Rice has an importance in Asia which is not reflected in the same way with the staples in the west, which is spread across a number of crops. Maize does play a small role in diversification – and in those areas of the country where rice growing is impossible maize is much more in evidence – but it can only be a small percentage of the whole. I don’t know how much effort is being made to wean the population off such total dependence on one crop but with the uncertainties with which agriculture is having to deal with the man-made effects on the climate it would seem to be a priority. I also don’t know how productive these paddies might be. It’s quite possible to fill the land with low yield strains that look good but have low productivity. I would like to think that this issue has been addressed in the DPRK as they have had many years where they have been developing their own science institutes. As an example of this I was shown a small area in Pyongyang where experiments are being carried out to grow rice directly on slow flowing rivers. In a country where levels of pollution of the rivers is low this makes more use of valuable resources, both of water and land. Obviously, a good crop in itself doesn’t mean that the food gets to all who need it. This is an issue everywhere and is evident in all capitalist countries. The supermarkets in Europe and America are bulging with all kinds of foodstuffs but the same countries have an increasing rate of poverty and food shortages are a serious problem for many. If that’s wasn’t the case why is there the abomination of the proliferation of food banks in some of the richest countries in the world. Yes, many people depend upon them, but what does that say about these societies? It’s not what you produce, or how much, it’s all a matter of distribution and control of the means of production. As long as profit dominates people will go hungry. In my limited time in the DPRK I wasn’t aware of these problems. People in all the places I visited seemed healthy enough, the people on the streets of Pyongyang, the people in the two trains I travelled on, the cultural places I visited as well as the people in the countryside. Those in the cities were well dressed and seemed, more or less, content with their lot. If you are up to your shins in mud cutting rice stalks all day you are unlikely to be wearing your best party frock so judging people in the countryside by what they are wearing is fraught with danger. But the bicycles and motorbikes that were standing close to the railway, whilst their owners worked in the fields, looked quite modern and functioning well. When I went around the National Art Gallery in Pyongyang I was asked how I read a painting of a poor, young, peasant boy ignoring a large dragonfly which was hovering around his head. This introduced one of the many cultural differences between Britain and Korea. For Koreans this had an immediate significance as it seems that all young Koreans (and here I assume both north and south of the false border at the 38th parallel) love to chase the big dragon flies that can be found throughout the countryside. The fact that he was ignoring the insect was proof that he was too tired or concerned with more important things, i.e., his empty stomach, than the almost innate wish of Korean children to chase these large insects. As well as the people the buildings in the countless small villages the train passed through looked in a good condition and gave the impression of a thriving community. Yes, many of the roads weren’t paved but when you have an embargo on the import of petroleum products that doesn’t leave a lot of slack for the ‘luxury’ of a paved road. Over the entrance into the railway station buildings there was always the dual portraits of Kim Il Sung and Kim Jong Il. In many of the villages you can also see columns commemorating these two previous leaders of the country. 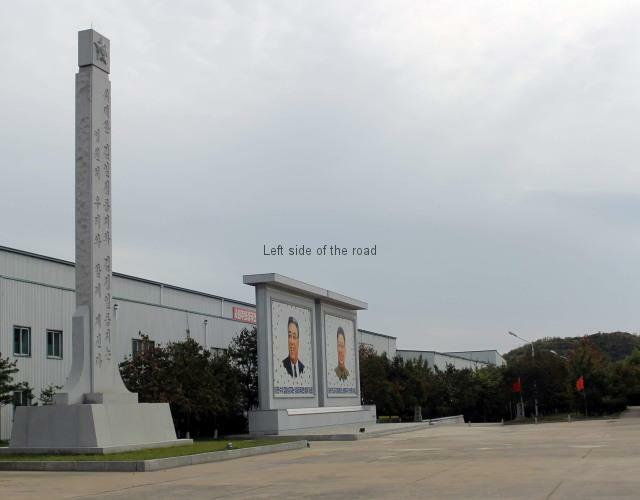 Also large mosaics would be erected in the main squares, sometimes with images from the revolutionary past, a visit from one of the Kim’s to the area or depicting life in the countryside – I saw one on the way from Dandong to Pyongyang of a couple of white cranes flying over the ripe rice paddies. Although, in the main, I understand the restrictions that foreign travellers have whilst travelling in the DPRK, they can, at times, be frustrating. After a little over an hour into the journey the train stopped at the town of Pyongsong. Here there were quite a few stalls selling whatever. Other passengers from the carriage had got off so I knew we would be there for at least a few minutes but when I tried to get off – just to see what was going on, after all I didn’t have any local currency even if I did want to buy something (although Chinese Yuan might have been accepted if you got that far) – it was politely indicated to me that it was not permitted. Now it’s possible that the train staff knew that the stop was only for a matter of a few minutes and they didn’t want me to get myself stranded. This is not as far-fetched as it might sound, as in many Asian countries foreigners are not considered to be really adults and are treated like children – probably based on the inability of generations of Europeans being able to understand the people and the customs in the countries they have invaded, normally due to their lack of desire to do so. In all these situations I encountered until I got into Moscow ten days later I could only use supposition to try to understand what was happening as the lack of any meaningful, verbal interaction was virtually nil – there’s only so much that can be conveyed by body language. This restriction was not repeated at any of the other stops where the ongoing passengers got off to buy something or to just smoke or stretch their legs so I’ll have to remain mystified why it occurred at the first station stop which was longer than just one allowing passengers to alight or jump on board. Needless to say that when I did go on to the platform, or beside the track when in the middle of nowhere, I never strayed too far and always kept a watch on what everyone else was doing, which was to include a few false alarms for all us. I think it was when we had just left Pyongsong that I received a salute from a young soldier who was manning one of the rail/road crossings. The train was still moving very slowly and I was just looking out of the window and he saluted as soon as he saw me. I smiled and nodded in return. I think that was the first time I’ve had such a response in my travels – often authority figures, whilst not necessarily being hostile (although I’ve met enough of them) are certainly more distant to foreign visitors. This entry was posted in Asia, Democratic People's Republic of Korea, Trans-Siberian Railway, Travel and tagged democratic people's republic of korea, dprk, north korea, pyongyang moscow, railway, rajin, rason, russia, trans-siberian by Michael. Bookmark the permalink.